Get onto a bike, and get out and ride. New York City is going bike-friendly. The Big Apple’s newest public transportation system, Citi Bike, is coming in March 2013. Citi Bike won’t use any taxpayer money, and is expected to create income for the city. Citi Bike will bring durable bicycles and docking stations to provide convenient and inexpensive mobility 24 hours per day, 365 days per year. Resources for riders, safety tips, bicycle laws, helmets, are free, and found at nyc.gov. Click the link for free bicycle maps, and Ride The City. RTC gives you quick bike route information, and is similar to Hopstop. 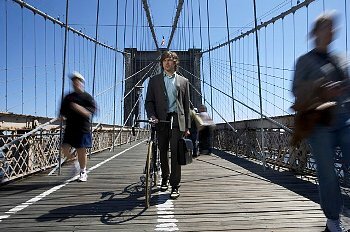 This link will take you to recommended bicycle rides over New York City bridges. According to the author of the article, the good ones are Brooklyn Bridge, George Washington Bridge, Manhattan Bridge, Williamsburg Bridge, and Ward’s Island Bridge. Off Metro. com is a great website for active city folk seeking out-of-Manhattan car-free day and weekend trips. Off Metro is a travel guide for native New Yorkers, and tourists, promoting a greener lifestyle using public transportation. Just a safety reminder. To avoid accidents when riding a bicycle, don’t wear flip flops, or other flimsy shoes. Protect your feet, and your overall safety with athletic shoes. For more information read my article Flip Flop Smarts: Beach Only. Posted on October 20, 2012, in Exercise, Lifestyle and tagged bicycle laws nyc, bicycle new york city, bike nyc bridges, car-free vacations, Citi Bike. Bookmark the permalink. Leave a comment.